When it comes to skateparks we are always going to want to build as much square footage as possible (we are in the business of building), but often times space and primarily budget limit what can be built. Because of this we have strived over the years to find away to build skateparks with small square footage that are still dynamic, a great ride & pack a lot in while also being extremely functional. Just because a community has a small budget doesn't mean they can't get an amazing skatepark. A prime example of this is the park we just completed in Johnson City, Texas- a little under an hour west of Austin. At just 3,000 square feet it is on the tiny size but the unique design is made for speed. We also made the adjacent path super smooth with some fun ledges & manual pads. Of all the small skateparks we've done, the Johnson City, Texas park is probably our favorite for both aesthetics, refinement, flow, and function. As an added bonus it's right on your way to the much larger park we built in Fredericksburg if you're heading west from Austin. 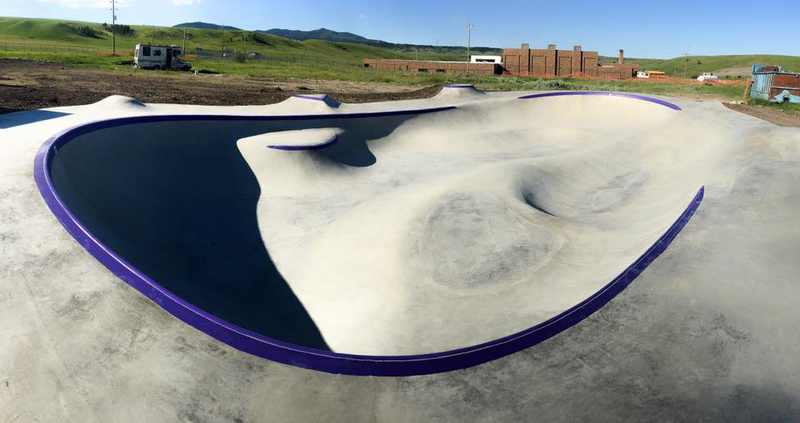 The Hays, Montana Skatepark on the Fort Belknap reservation is another tiny park we completed last summer with Montana Pool Service coming in at just 3,300 square feet. Many Portland skaters will be familiar with our Alberta Skate Spot on 52nd & Alberta at Khunamokst Park in NE Portland. It's important to note that during the design process the 'skate spot' was supposed to be even smaller (hard to believe- I know)- we had to push the city & architects just to get it to the size that it is today. Althought the Portland skate community definitely could use and would accommodate a much larger park, we were happy to do our best to make the most of the small space. Our smallest public skatepark to date was built in Eau Claire, Wisconsin back in 2013. The skate community had a lot of requests for the teeny tiny park so we did our best to pack a lot in to the just 2,400 square foot park. And lastly- our tiniest park of all- the Portland mini skatepark at a private residence. Just 750 square feet of fun.